This is a non-spoiler post. Please keep the comments spoiler free as well. I finished Mass Effect 2, and it was even better than the first one! I’m a reader. I love books. When I’m reading a good story, I find it hard to put down. There’s always a point in the last third of a book where the plot kicks into high gear and starts the downhill rush towards the denouement. I have to be careful about when I get to that point in a book because once I get there I absolutely have to finish it before I can do anything else. Mass Effect 1 and 2 affect me the same way. I actually started the last mission in ME2 much too late at night and finally had to tear myself away around 2 am but before I actually finished the game. So all day the following day at work, I was counting the hours until I could get back on and finish. I enjoyed Mass Effect 2 as much as I had hoped to and much more than I expected to. I blame my hesitance to start the game on my lowered expectations and on the crappy marketing leading up to release. All of the talk about a darker tone, and the awful preview videos with Jack, had me concerned that they were taking Mass Effect more towards a Dragon Age style which I didn’t enjoy much. Turns out my fears were totally baseless, I enjoyed all of the new characters, including Jack (which I was really surprised about). I was just as (or more actually) emotionally involved in the story. The Mass Effect games are part of a very small group of games (like KOTOR, oddly enough) where my emotional investment in the characters is just as deep as it is when I read a novel. I think it is a combination of “good enough” facial and body animation combined with excellent voice work, good writing, and just enough choice allowed in the dialogue trees. Having fully voiced dialogue for both my character and for non-player characters keeps the immersion level high. Limiting the character customization so that non-player reactions to my character’s appearance is appropriate (don’t refer to me as a boy if I look like I’m 60 years old). With immersion maintained at such a high and consistent level, it is much easier for me to develop a bond with my digital teammates. 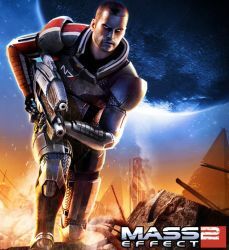 So if you are into Science-Fiction, space opera, adventure stories, I highly recommend playing both Mass Effect games. You don’t have to play the first to enjoy the second, but it is a better experience having played both. I thought it was an excellent game too, though I don’t think I got “into” it as much as I did with the first one. I think it had to do with the layout of the game, with the events of number one taking place mainly in 4 or 5 different places, while this one took you all over the place. It didn’t detract from my enjoyment of the game one bit though, I just wasn’t able to feel as emotionally invested as I could have. Mass Effect 2 is a great game, glad you liked it too.